While organic coconut oil quickly gains popularity, many people wonder if this is a healthy choice or if the high fat content makes it unhealthy. It's important to remember that not all fats are created equal, and in the eyes of most nutrition experts, coconut oil is not an unhealthy choice. Coconut oil is indeed full of fat. However, proponents of coconut oil point out that it has been a staple food in many tropical countries where cardiovascular disease is largely non-existent. 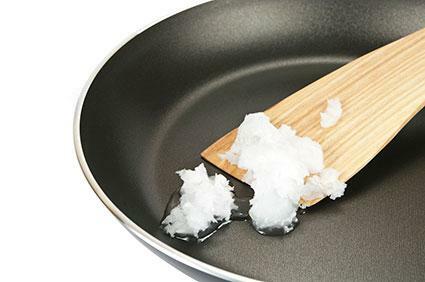 In addition, a study from the Asia Pacific Journal of Clinical Nutrition suggests that coconut oil may boost HDL (the good) cholesterol, while a study from the Federal University of Alagoas in Brazil suggests that coconut oil is actually associated with weight loss. Coconut oil does not contain cholesterol. However, it still contains saturated fat (which is "unhealthy"), and thus should be used in moderation, as part of a healthy diet. Some health experts, such as Dr. Oz, suggest that one to two tablespoons per day may have a beneficial effect. Of course, you should never change your dietary habits or add supplements to your diet without talking to your physician first. Some people believe that the organic version must somehow be better for them than the non-organic product. In general, published literature lacks strong evidence that organic is more nutritious than non-organic products. With that said, many people feel more comfortable with the fact that organics generally go through a gentler processing regimen and don't include pesticides, chemicals or additives in the finished product. With non-organic products, the manufacturing process may include drying/smoking to extract the oil. The processing may also include refining/purification, bleaching, and the addition of additives like lye, according to the Natural News. With organic coconut oil, it's unlikely to have undergone as much processing to make the coconut oil. Then again, coconut oil that's produced by using good-quality copra (raw coconut) is clear and has a "good" aroma, so the quality of the coconut oil (and whether it has been produced using traditional methods) is of importance, whether it's organic or non-organic. Virgin (unrefined, high-quality) coconut oil may retain more phytonutrients--antioxidants and phytosterols, which protect the heart and have other health benefits. In the case of coconut oil, some non-organic oils appear to have comparable efficacy (particularly virgin or coconut oils that are produced using traditional methods). There can be many health benefits from the use of unrefined organic coconut oil.